The EF381SC 12-string dreadnought is handcrafted in our pro series facility that has been building precision quality instruments over five decades. 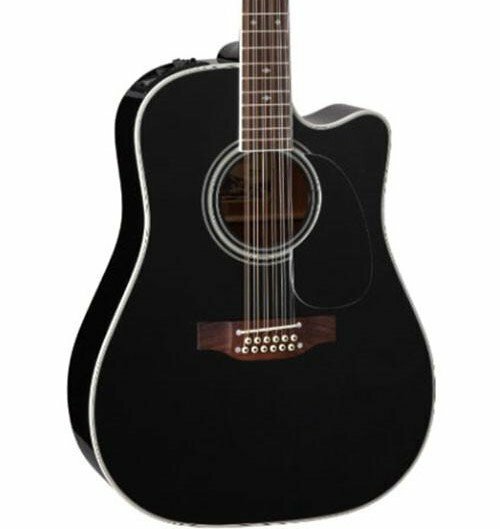 The versatility of this guitar begins with its solid spruce top that can play sweet mellow passages or power chords with equal ability. The maple back and sides are a perfect reflector for the tone generated by the soundboard, while the gloss black finish looks great under the stage lights. The mahogany neck is joined to the body with a traditional, ultra strong dovetail joint. IncludesTakamine’s CT4B II preamp system paired with the unique Palathetic™ under-saddle pickup for peerless amplified response. The highly acclaimed CT4B II preamp system with three-band EQ, volume control and built-in tuner.